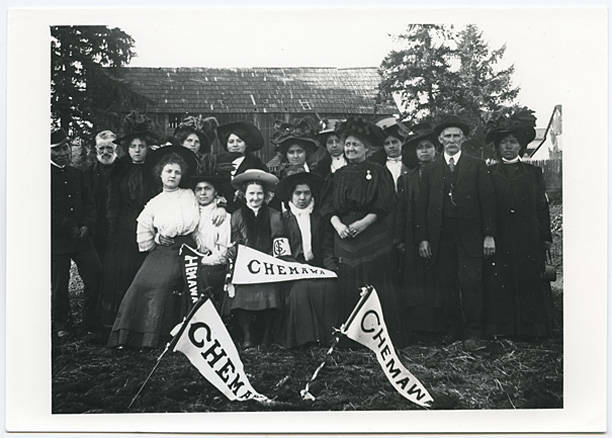 A group of individuals celebrate at the founding site of the Forest Grove Indian Training School which was later named the Chemawa Indian School and moved to Salem, Oregon. In this photo are Edwin L. Chalcraft, second from right, and Alice P. Chalcraft, his daughter, seated in front with white hat. From back of photo: Site where Chemawa School began, Feb. 25, 1880 at Forest Grove, Oregon. 90-202 (Chalcraft collection). Edwin L. Chalcraft, second from right; Alice P. Chalcraft, his daughter, seated in front with white hat.